The Indian-built launcher carrying a 1.5 tonne satellite blasted off Wednesday morning. 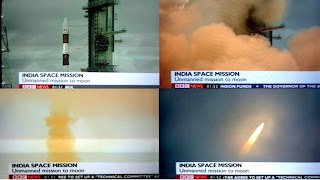 The launch went as scheduled from the Satish Dhawan Space Centre in Sriharikota at about 06:52 local time [00:52 GMT]. The probe will circle the moon for two years mapping the surface and collecting data about the lunar poles. The launch vehicle has been successfully employed on 13 previous occasions, but this is India’s first attempt at sending a probe to the moon. Although there is a potential commercial spin-off, there has been much criticism due to the high poverty in India [BBC / isro.org]. The pictures coming Live from India were somewhat disappointing. The initial shot was focused on a close-up of the base of the rocket at ignition. A wider shot followed showing clouds of smoke before cutting to a shot of the sky, the camera desperately searching for the launch vehicle. When another camera finally picked up the rocket streaking into the sky it was only a matter of seconds before it disappeared into clouds. But aside from the poor picture coverage it was a moment of history for India.